"How often should I get a relaxer?" This is a question that I get asked A LOT. I am all about healthy hair so a lot of people come to me who are looking to get their damaged hair back healthy. One of the top questions women ask me about their hair is how often should they get a relaxer. My answer to this can be quite extensive but for the sake of this blog post I will give you the short version. 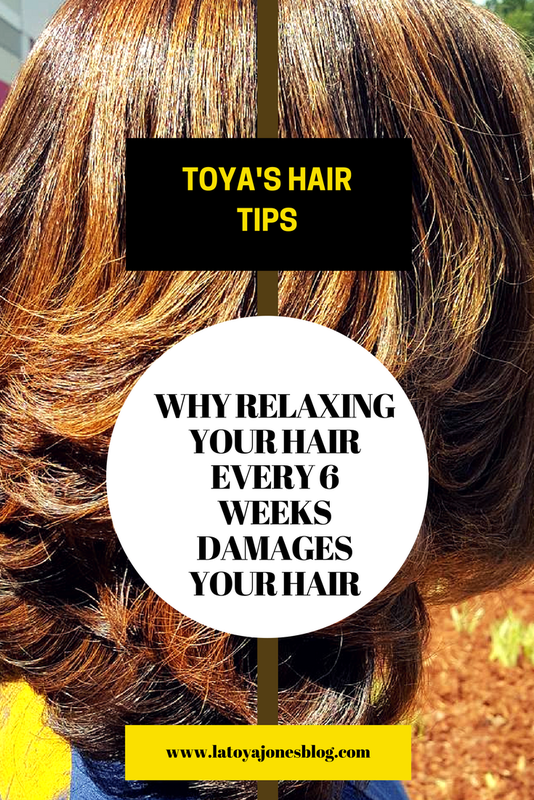 We have all been trained to get our touch up relaxer at 6 weeks like clock work. However, since I became a hairstylist I have been thinking more and more about this. Here is my reasoning. The normal, average head of hair grows at a rate of half an inch per month. Once the hair is relaxed, it is a permanent action to hair that has already been relaxed does not need more relaxer as this is what causes damage and breakage. However, when 99.9% of us get a relaxer, the stylist doing the relaxer is processing at least 2 inches of hair. This means that 1.5 inches of the hair is being over-processed. If you break this down, every time you get a relaxer at 6 weeks that extra 1.5 inches of hair gets overlapped at least 4-5 times. As you continue to do this for years and years, eventually the hair becomes weaker and much thinner. That is why a lot of times your relaxed hair is thick at the root and thin towards the ends. It's because the hair on the ends has been over processed to death as the hair on the roots has not. So, my theory is that if as a stylist I am processing 2 inches of hair, why not wait until the clients have at least 2 inches of new growth before getting a touch up? This equates to 16 weeks in between touch ups. I follow this rule for my clients and my relaxed clients have thick hair from the root to the tip, and their hair is long! So, I recommend getting your relaxers every 4 months. This sounds like a lot, but trust me, your hair will thank you!